As one of the longest-standing online gaming purveyors – and as one which continues to pull in critical praise, it’s no surprise that MFortune Slots continues to attract a wide range of players from all over the web. 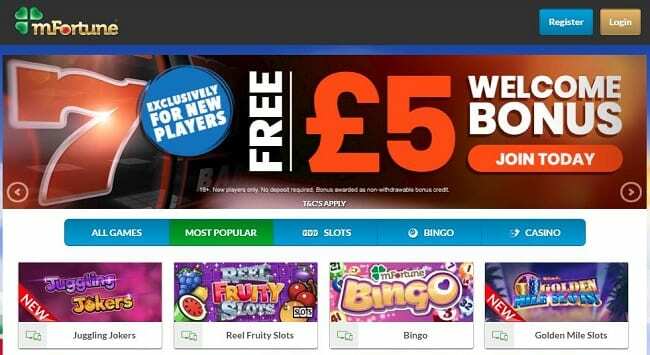 It currently offers a £5 free slots bonus which you can claim when you join the site. £5 NO DEPOSIT BONUSNew Customer Offer. T&Cs Apply. 18+. Please Gamble Responsibly. At MFortune Slots you can enjoy plenty of top games and try out their latest bonuses. This online gaming collection is largely comprised of unique slot experiences and a handful of virtual casino elements, meaning that players who are looking for something a bit different can dabble in exclusive reels and a number of interesting table games and bingo experiences via the games catalogue. Carry on reading our MFortune Slots review to find out more about the site. New customers can rejoice as current MFortune Slots promo codes grant a nice free welcome bonus without you needing to throw in a penny of your own. In terms of theme, the site doesn’t go too crazy – but what is interesting is that it is neither too brash nor too boring. You may have seen similar features in our MFortune Bingo review, as the two areas both fall under the same website. The draw in some sites may lie in its dedication to a wacky theme or overlay – but this brand focuses more on content rather than glitz and glamour. For users of the desktop site and the mobile platform, too, this is a site that ticks all the boxes. The MFortune Slots welcome offer currently gives you £5 to play with when you first sign up – meaning that you can really take some time to get used to the site and to try out your no deposit slots bonus to see whether you like the unique brands and features. On top of the free bonus credit available from the opening promotion code, MFortune Slots will also grant you 100% cash matching on your first deposit – meaning that you can pay in as little as £3 and up to £100 to get double the money to play with. This is a great way to try out the site’s many exclusive new slots games and there’s a nice casino contingency here, too – but we do advise you take on any promo codes that you come across while they last! The brand’s bonus codes have changed in recent times and, while existing customers can enjoy a variety of different bonuses, offers and events, it’s always worthwhile taking up a deal while you can as one of the site’s new customers. Something else that is becoming increasingly popular in this industry is the introduction of loyalty schemes. As an existing customer with an MFortune Slots login, you can wrackup points every time you login, deposit and play and eventually you’ll be able to turn those points into bonus funds or deposit bonuses. In addition to these, you can even turn your points into novelty gifts such as mugs, keyrings and even a car! Let’s talk about what the site has available in terms of games – as stated, it may not be a catalogue brimming with too many options, but what is here is refreshingly different to other sites. The casino element may not be as broad or as comprehensive as bigger sites – but the site does at least present its catalogue in a pleasant fashion that is easy to navigate and to get used to. See our Mr Spin review for another site from the same platform. It’s very much a mobile-focused catalogue – all the games here will work from device to device, and they are presented and launchable in a tiled, responsive design that is modern and appealing. If you’re tired of playing the same old games and brands elsewhere, then why not take a chance on MFortune Slots? The website is well worth looking into if you are tired of playing the same branded games elsewhere – however, the range here and the look of the site may come across as a bit limited or basic compared to some of the bigger platforms out there. Despite this, however, MFortune Slots promo codes ensure that new customers can ease into the site without issue – and it is clear to see why other reviews laud the platform for being easy to use and having a fairly unique approach to online gaming. The slots and casino games for this site are exclusive to the brand and this is clearly where the appeal lies – but what other details should you know about before jumping in and grabbing an MFortune Slots login? Let’s take a closer look. This is a site that prides itself on being easy to use, well-signposted and with plenty of accessibility and charm across all devices. While other, newer slot websites may focus on brand appeal and the number of games they can squeeze into their catalogue, MFortune Slots opts for a more casual approach. This can be both a blessing and a curse, depending entirely upon what type of player you are. For casual players, there certainly is enough variety here – but there are sites with a bigger range of games elsewhere. That being said, the bonus codes available for you at registration here are very competitive indeed – not many sites offer up £5 in free bonus on a plate, meaning that it’s well worth signing up for an MFortune Slots login while you can get this deal. Other sites offering unique slots like this aren’t too common – there are many that operate on widely-known engines such as Dragonfish, Playtech or Cozy Games – meaning that the big draw here definitely lies in the sheer difference on offer, as well as the dedication to great opening deals. If you’re looking for an MFortune mobile slots download, you’re in luck – though it is presented a little differently to apps and services you may find in various stores. The MFortune Slots download is available directly through the site, meaning that you can have a shortcut or launchpad as such delivered to your phone in just a few taps. It’s not quite clear why there’s no official app available through any of the main stores right now, but the availability of a download via the site is a nice touch for anyone looking to get their gaming on the go. Beyond this, however, the mobile slots experience is just as satisfying via the main site when you visit from your phone or tablet. Simply visit the site with your login and you will gain access to all of your banking details and all the games that you want to play on a flexible and responsive basis. The site does well to port much of the main content over to the portable platform – but many players used to bigger sites and more comprehensive catalogues may well find things a tiny bit on the simple side. This isn’t always a criticism – as less is often more when it comes to online gaming! When it comes to funding and wagering, the site is at least somewhat up front. If you want to take money out on the back of a bonus code deal, feel free to do so after playing through bonus and deposit just the once – we’re not sure if this applies to the no deposit deal, meaning that we do advise you keep a close eye on things. You can fund and withdraw from your account with a wide range of options, from PayPal and Ukash to Skrill games deposit and UK cards. You can even pay as little as £3 in via phone bill, a nice feature which is exclusive to MFortune on the whole – and its sister brands. You can generally expect money to reach you within a week – but this may be only a few days for PayPal users. If for any reason you need to make a complaint, or you have a query of any kind, you can easily contact a helpful member of the team through your MFortune Slots login. You can get in touch simply by calling the contact number on 01384 880842 – or speak to an expert member of their customer service team via the live chat function on the website. After completing this MFortune Slots review, we feel it is a long-standing site with plenty of charm, exclusive games and features – meaning that it will likely appeal to those players who have tried and tested the Dragonfish and Playtech standards to death elsewhere. That being said, there isn’t as much to go on here as there is elsewhere, therefore it could be fairly underwhelming for seasoned gamers. All things considered, it is definitely worth getting involved for the promo codes and welcome offer alone!